League and Tournament management has never been easier! Record daily results in minutes. Standings will update dynamically. No more fumbling over spreadsheets. Let BracketPal's flexibile tournament module generate your pool play and playoff brackets in seconds. BracketPal's autoscheduler employs industry-leading algorithms to accommodate even the most unusual of scheduling requirements. Schedules take minutes rather than days. 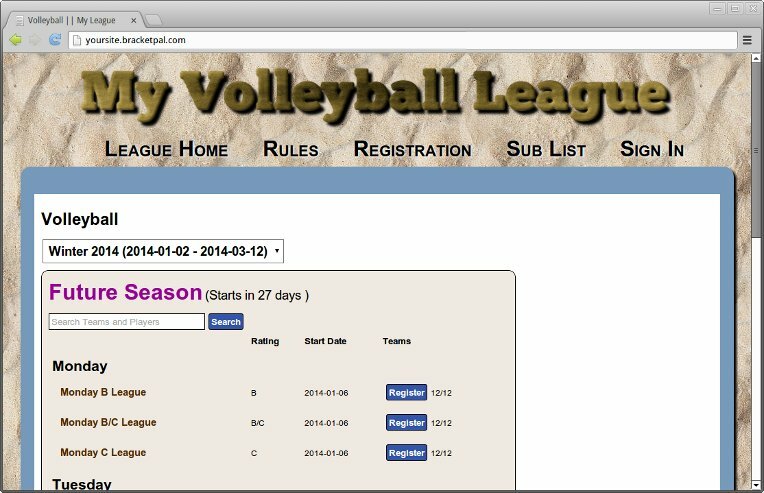 Teams and Players can customize their own profile pages with photos, contact information, league and tournament history, and free-agent preferences. Conveniently and securely accept registrations with credit card and PayPal payments. Easily track of vital statistics (example: Home Runs, Shots, Touchdowns, etc). Richard Dial - Uncle Mike's Highway PubThe organization and ease of use for the players and even admin side make for a much more fun season not just of leagues but tournaments too.